What do Argentinos do when they are bored? Any idea? No? Frankly, me neither. 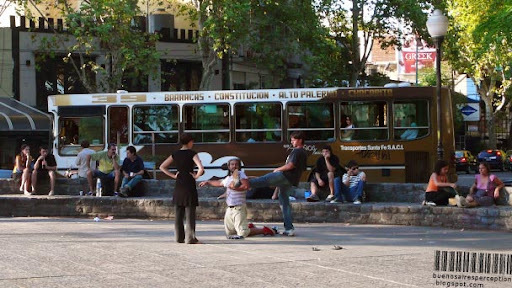 What these three guys were doing at the Plaza Serrano in Palermo Soho, however, caught my attention. I was observing the trio for awhile while sitting in the sun, but I was not able to figure out what these funny activities were all about. Then my mind came up with an explanation so simple and yet so profound! The girl asked the kneeling guy to hold up the leg of her boyfriend so she could check his shoes for dog poo. Luckily the newly bought Nikes were still clean and tidy. Boy, what a relief! Well, I'm kidding. I still have no idea what they were doing! I guess it was some fancy relaxation method -- Reiki, Shiatsu, T'ai-chi, Tae Bo ... whatever, you name it! Quando estive em Bs As, faltou conhecer San Telmo. Pity that poor lad's knees! I'll go with your first idea. I know this is a little (completely) off-topic, but I've been wanting to ask you if you know the Argentinian film called Hombre Mirando al Sudeste by Eliseo Subiela? Whatever they are doing, it must be an everyday occurrence. No one else is looking at them. :) What a coincidence. I just came home half an hour before writing this and inadvertently I stepped into some dog poo right outside my door. Too bad I was alone, I could have tried these moves to check on my shoes. Your words made me smile!